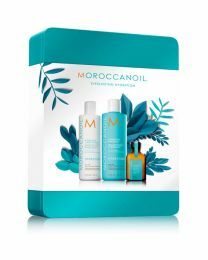 Limited edition gift set by MoroccanOil. Spoil yourself or a loved one with Moroccanoil Hydration Trio Gift Set beautiful packaged in Morccanoil Tin Case. Featuring 3 favourite Moroccanoil hydrating products. Infuse dehydrated, dry hair with much-needed moisture. Moroccanoil® Hydrating Shampoo conditions hair with antioxidant-rich argan oil, Vitamins A and E and moisture-attracting red algae—for hair that looks and feels healthier. This moisturizing shampoo is gentle enough for daily use and provides optimal hydration for both normal and colour-treated hair. Increase your hair’s manageability, smoothness and shine. colour-safe. Sulfate-free, phosphate-free and paraben-free. This lavish Hydrating Conditioner by Moroccanoil contains a super moisturising formula which gently nourishes and conditions the hair to leave you with silky soft locks. Rich in Argan Oil, Vitamins A and E and Red Algae, the antioxidant formula replenishes the hair to increase managability and shine. Perfect for use with Moroccanoil Hydrating Shampoo, this sulphate and paraben free conditioner is suitable for every day use on normal and colour treated hair. Hair that’s silky, healthy, shiny and full of life. An essential foundation for hair styling that can be used as a conditioning, styling and finishing tool. Infused with antioxidant-rich argan oil, strengthening proteins and shine-enhancing vitamins. This treatment detangles, speeds up drying time and boosts shine – leaving hair smooth, manageable and nourished with each use. 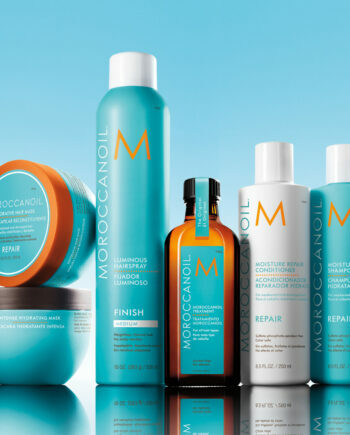 Buy MOROCCANOIL on-line today at Riah Hair.